Regulars readers to the site will know we’ve been screaming out for a decent attacking midfielder ever since we effectively gave up on Graham Dorrans ever being meaningfully fit. We suggested pushing the boat out for Birmingham’s Jota, but one of our readers Robrob57 scouted one of our opponents HJK’s best players today and inspired the very feasible notion of a second low-cost raid on the Finnish champions for a player who could well be an absolute gem. At just 19 years of age, and even applauded off by some home supporters when subbed, Eetu Vertainen showed enough maturity, poise, trickery and quality to suggest that even despite his tender years, Vertainen could well be a cheap-as-chips solution to a huge Rangers problem and could be a serious possibility for Gerrard, Scoulding et al to have a look at. The Finnish U21 international was probably our opponents’ best performer, and his deal in Scandinavia expires this December – his value is only cited at a modest six-figure sum and after Rangers’ success in nabbing Morelos from the Fins, Vertainen really would be such a smart move. 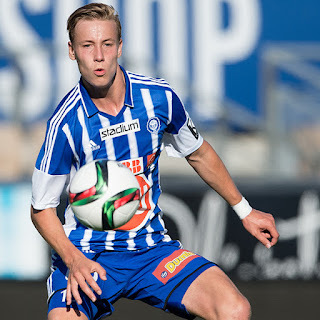 With just 10 days or so to go till the window closes, if Rangers were to leap at HJK with a £500K bid for Vertainen, it’s quite possible they’d secure their man on the first attempt and bring in an attacking midfielder for such a low cost and with all the potential in the world. It could be a very canny move indeed. Wasn't any great scouting on my part IN, the boy was just an obvious stand out. When I saw he was only 19 it just made it seem even more sensible. Markets like Finland, Sweden, Norway, Holland etc. must be ripe for picking up players like him and we should play more of these type of matches. They are simply more technically gifted than their Scottish counterparts.